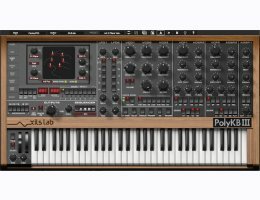 PolyKB III is also available as part of an exclusive bundle that contains both PolyKB III and the award wining XILS 3. Add two gorgeous, creamy multimode filters, self resonating in all modes, and Xils exclusive 0df technology. Three Analog modelled envelopes, with time multiplication, and looping capabilities. Two complex LFOs. They complete the picture to offer you this fat, warm and immediatly inspiring analog sound. It wouldn’t be a XILS-lab instrument if it didn't have innovative & exclusive features like the Per Voice modulation engines, or the giant Step Modulator, to propel it into the XXIth century. Make each note different : The Voice XY is a Per Note Quad XY modifier. You can control in a 2D square up to 4 different parameters to create from subtle to wild variations for each coming new note. Control your sound in 3D Space : With the Space XY module, you can place each note in a 3D True Stereo Space, and build stereo scenes that no additional external effect can achieve. Furthermore, you can make it move with chaotic functions, adding incredible life to your sounds. You have never had so much artistic control over the stereo field. If you combine these two Per Note modifiers with the True Unison engine, you’ll soon get amazing, dense, and breath taking sounds, that will proudly take their place in a mix at once. And to operate it, you simply place and move balls, representing the voices, in a square. So easy, so immediate, so tempting, and … so powerful ! Hyper Modulations : The Polysequencer can now be used as a 128 steps, 4 lines/16 destinations giant Step Sequencer Modulator, allowing you to sculpt not only the most detailed TranceGate patterns, but also Slides or incredible rythmic patterns. Or everything together. Or something else, completely new. Everything is there to allow you to create fully organic and expressive presets : The final encounter between analog authenticity, and the modern age. YOU NEED AN ILOK DONGLE TO AUTHORIZE THIS VERSION OF PolyKB II !!! Continuously Morphing Oscillator : Morphing is controlled by all modulation sources. Triangle to Saw to Double Saw to Square to Pulse for endless possibilities. Hard Sync on board. A third noise oscillator is there too, Osc 2 can also behave like a LFO. Self Oscillating capable filter, with pre-post drive module, direct Keyboard tracking and Envelope 2 knobs for immediate tweaking. The filter is an essential part of each analog synth, but youï¿½ll have to try the demo to get the feel of it, as nothing we could say can fully describe its creamy and precise character. Full modulations tools for expressive instruments : Offering a standard hardwired Modulation Matrix , then another fully customizable Modulation Matrix wasnï¿½t enough, the PolyKobol also provides an exclusive XY bidimentional pad to control all parameters. The PolyMYX is controled by the Polyphony, this means that each note you play or sequence in real time on the PolyKB can sound from slightly to vastly different. Then of course you can assign any Midi controler to any parameter to fine tune some midi parts, or achieve tremendous effects. When combined with the Polyphonic Integrated Sequencer you can build anything from everchanging patterns to solid bulletproof analog sequences like in the ancient times. The 8 part Polysequencer brings the concept of step sequencers one step beyond. You can record 8 parts in real real time, or in step mode. You can transpose sequences according to the root note with the tuned mode. It also has an incredible step play mode for real live chord sequences. Stereo Scene and Unison : The PolyKB's gorgeous analog character can be reinforced by different features, like the custom number of Unison voices, and our very special Drift knob (Which randomly adds a more or less drastic disctinct character to each voice). In Addition, our exclusive DynaMYX Pad (Dynamic stereo Modulation XY Pad) allows you to build unique stereo scenes by allowing each note played to have a distinct stereo position. Controlled by polyphony, this unique effect will make your analog the wideset, most intense you have ever heard. We have given you some great presets to start with and can't wait to hear what you come up with. Of course you can also control the width of the overall stereo scene, and the direction of the mikes. Enveloppes and LFOs : The 2 standard ADSR are hardwired to the filter cut off and the gain, but you can use them as modulations sources too. A keyboard tracking is available for the enveloppes. In addition, ADSR2 can loop, or can be used as a LFO as well to complete the 2 main LFOs and the (synced) Sample & Hold module. The full featured LFOs can also cumulate several waveforms, like a sine and a square, or a synced noise ( Sample & Hold ) added to a Ramp Up. They have a fade in time, a delay time, and can be synced, to the host midi or internal clock. Of course they can be polyphonic or monophonic, so you can get both usual tremoloe, vibrato and wha effects, while preserving a second Lfo for more subtle modulations. You'll also get some additional parameters, like the possibility to control the speed of all Attack parameters with velocity ( Found in the Main Matrix Modulation), or the Decay/Release of all enveloppes. This is the key to expressive Keys or Brass/Strings patches, but you can use this to design rageous expressive leads as well. Additional paramaters related to the enveloppes are the 3 different Mono Modes, with low, high or last note priority. The Poly Circular and Poly Reset play modes are tied to the PolyMYX and DynaMYX pads described above. YOU NEED Either AN ILOK DONGLE or Elicense TO AUTHORIZE PolyKB II !!! No refunds will be issued due to incompatible OS or Host Applications !! !